Rate this project Glenn Cady has announced the release of Ultimate Edition 2.4, an Ubuntu-based live DVD with media codecs, eye candy and -- the kitchen sink: "It has been out for about a week, but I have had a lot happening in the meantime. A burnt power supply, a smoked 1 TB drive, painted a house and caught the flu. Ultimate Edition 2.4 was built off Ubuntu 9.10, all upgrades pre-installed as of current. This release is the largest release to date and is absolutely loaded with excellent tools, many new to Ultimate Edition. This distro is lightning quick on boot-up. I must apologize, the usplash does flicker on the screen when live; once installed it works as expected. Please enjoy ladies, and gents, a ton of work went into making this distro, more then any previous." Check out the release announcement and release notes for additional info and screenshots. Download (MD5): ultimate-edition-2.4-x86.iso (2,417MB), ultimate-edition-2.4-x64.iso (2,444MB). • 2015-09-09: Distribution Release: Ultimate Edition 4.6 "Gamers"
Ultimate Edition developer "TheeMahn" has announced a release of a new build of Ultimate Edition. Version 5.5, featuring the KDE Plasma 5.9.5 desktop, is based on Kubuntu 17.04, which is a distribution supported for nine months only (until January 2018). From the release notes: "Ultimate Edition 5.5 was built from the Ubuntu 17.04 'Zesty Zapus' tree, using a combination of Tmosb (TheeMahn's Operating System Builder) and work by hand. Tmosb is also included in this release (1.9.9), allowing you to do the same; it can build more then 3,000 operating systems. This release is NOT a long-term supported (LTS) release; it was built in anticipation of the Ryzen build, same as Ultimate Edition 5.4, both rock on an AMD Ryzen. I can almost promise your days of waiting for a releases are gone minus LTS. Polishing releases takes time and I do not care how fast your computer is. I will only invest so much time on a non-LTS. Does not mean it will not rock out on Intel; however, deliberate support has been added for Ryzen. I am going to let this release become what it will be and what it is a non-LTS. Enjoy!" Download (MD5) the installable live DVD image from SourceForge: ultimate-edition-5.5-x64.iso (4,081MB, pkglist). Ultimate Edition developer "TheeMahn" has announced the release of Ultimate Edition 5.4, the latest version of the project's Ubuntu-based desktop Linux distribution. This build is based on the just-released Ubuntu 17.04 and includes, for the first time, the Budgie desktop: "Ultimate Edition 5.4 was built from the Ubuntu 17.04 'Zesty Zapus' tree using a combination of Tmosb (TheeMahn's Operating System Builder) and work by hand. Tmosb is also included in this release (1.9.8), allowing you to do the same. It has the capabilities to build over 3,000 operating systems. This release is not a long-term supported (LTS) release. Currently I have only built the tip of the iceberg. I have finished building Ultimate Edition 5.4 and can build 5.5 based on Zesty (17.04). Our beta testers asked for inclusion of Budgie and I have made it so. I try and listen to my people. This release has the Budgie desktop; however it is not set as default. One of my beta testers and programmers tells me today that we will have an edition for the ARM architecture next release." Here is the full release announcement. Although the release is labeled as "lite" as its default desktop environment is MATE, it is a 3.7 GB download due to the inclusion of a large number of popular packages. Download (MD5) link: ultimate-edition-5.4-x64-lite.iso (3,774MB, pkglist). A new version of Ultimate Edition is out and ready for download. Version 5.1 is still based on Ubuntu 16.04, but it comes with the KDE Plasma desktop and, as usual, plenty of customisations and eye candy: "Ultimate Edition 5.1 was built from the Ubuntu 16.04 'Xenial Xerus' tree using a combination of Tmosb (TheeMahn's Operating System Builder) and work by hand. Tmosb is also included in this release (1.9.7), allowing you to do the same. Tmosb 1.9.8 has also been uploaded allowing you to build up to Zesty over 3,000 operating systems. This release is a long-term supported (LTS) release, supported until the year 2019. It is most certainly worthy of the Ultimate Edition title. I hate KDE. No news there, but I believe I spent a ton of time refining it to make our users happy. Did I mention I hate KDE? Looks too much like that other operating system." See the release announcement for more information. Download (MD5) the live DVD image from SourceForge: ultimate-edition-5.1-x64.iso (2,763MB, pkglist). Ultimate Edition is a distribution based on Ubuntu which strives to provide an easy-to-use desktop operating system. 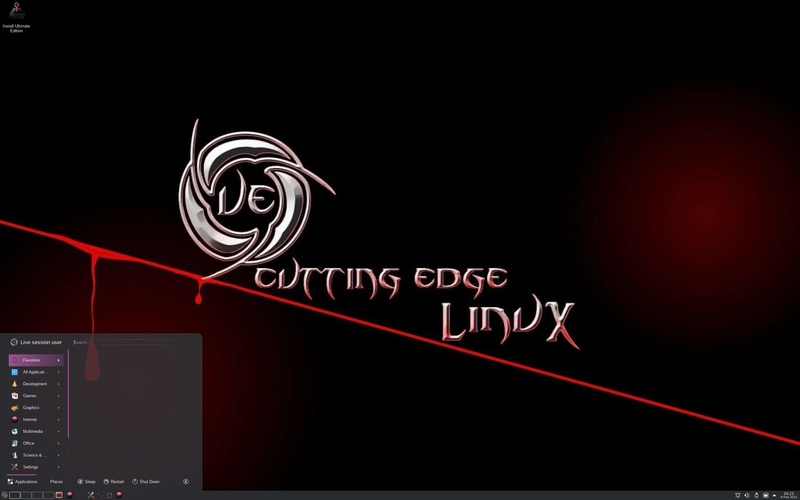 The project has announced the launch of Ultimate Edition 5.0 LTS which is based on Ubuntu 16.04. The new release is currently available in a MATE 64-bit edition, though other desktop flavours and 32-bit builds are planned. "What is Ultimate Edition 5.0? Ultimate Edition 5.0 was built from the Ubuntu 16.04 'Xenial Xerus' tree using a combination of Tmosb (TheeMahn's operating system builder), almost completely re-written. Tmosb is also included in this release, allowing you to do the same. This release is a long-term supported (LTS) release, supported until the year 2019. This release is most certainly worthy of the Ultimate Edition title. Currently I have only built the tip of the iceberg, starting with a 64-bit 'Lite' based on MATE 1.14.1. I have full intentions of building a 32-bit of the same, a full variant based on GNOME, a Gamers edition, perhaps another Lite variant based off Xfce and, time permitting, a Developer's edition." Additional information and screen shots can be found in the project's release announcement. Download (MD5): ultimate-edition-5.0-x64-lite-mate.iso (2,888MB, pkglist). Ultimate Edition developer "TheeMahn" has announced the release of Ultimate Edition 4.9, the latest update to the project's Ubuntu-based distribution featuring KDE as the default desktop: "It is tradition here in the Ultimate Edition land to release a special Ultimate Edition release for Christmas and this year will be no exception. Ultimate Edition started in 2006 by releasing a Christmas version to the general populous. You can learn more about that by reading an interview Sourceforge conducted on me in 2009. What is the special release, a Christmas-themed Ultimate Edition? No, ARM steps to the plate in this release, a return to the roots of Ultimate Edition in the form of LTS (long-term support), and a step into the future all in one snap. TheeMahn, please stop being cryptic." Visit the distribution's home page to read the full release announcement. Download (MD5): ultimate-edition-4.9-x64.iso (3,445MB). This month's Ultimate Edition release galore includes a separate 4.2.3 "Light MATE" edition and a brand-new release for the armhf architecture, version 4.2; find them all on the project's SourceForge page. 2015-09-09 Distribution Release: Ultimate Edition 4.6 "Gamers"
TheeMahn", the developer of the Ubuntu-based Ultimate Edition distribution, has once again produced a special "Gamers" edition of the product. This is a 4GB live DVD with a nice collection of games, as well as the XBMC (now called Kodi) media centre software, PlayOnLinux and the Steam client: "It is the ultimate entertainment system. It has a list of games that just scrolls by on the screen even on a 4K monitor. It does not stop there - XBMC has been pre-injected and set up into the system with over a million channels and streams to cut the cable TV bill on 69 networks, and the ability to add more. 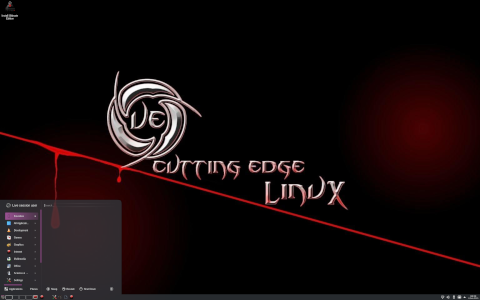 Compiz is back and rocking right off the live disk. Productivity? The entire LibreOffice suite is also included. Wine and PlayOnLinux are pre-installed to allow you to play your Windows games, not to mention Steam. This one fits on a DVD. I want to break down this for the gamers - I can play more games in this OS than on any Windows OS." See the release announcement for more information. Download (MD5) link: ultimate-edition-4.6-x64-gamers.iso (4,098MB). TheeMahn has announced the release of Ultimate Edition 4.2, an Ubuntu-based distribution featuring the MATE 1.8 desktop environment: "Ultimate Edition 4.2 was built from the ground up debootstrapped from the Ubuntu 14.04 'Trusty Thar' tree using Tmosb (TheeMahn's Operating System Builder) which is also included in this release. This release is a long-term support (LTS) release, supported until the year 2019. This release is most certainly worthy of the Ultimate Edition title. What makes this operating system different then any other operating system on the entire planet? The entire Mate 1.8 repository was first repo-stormed by a world-changing application I am developing. I have told the world it was coming. I have included many, many tools I am constructing that reside under the hood of virtually all Ultimate Edition releases." Read the rest of the release announcement for further details. Download (MD5): ultimate-edition-4.2-x64-lite.iso (3,017MB). Ultimate Edition 4.0, another new release of the Ubuntu-based distribution (this time in MATE and GNOME variants), comes just two weeks after version 3.9: "Once again I am not going to make a big deal out of this release. It is very nice and works very well; however, it is based on the Ubuntu 13.10 'Saucy Salamander' branch and has very limited support time left. Our efforts once Ultimate Edition 4.1 is released is undivided concentration on Ultimate Edition 4.2 and Ultimate Edition 4.3, a long-term supported (LTS) release, previously released as a beta. Repostorm is honing Mate 1.8 to perfection with each line of code I write, the base of what will be in Ultimate Edition 4.2 Lite. A lot of catchup is going on in the pursuit to perfection as I am hoping to present you in the release of Ultimate Edition 4.2." Here is the brief release announcement. Download (MD5): ultimate-edition-4.0-x64.iso (3,282MB, desktops: MATE 1.6, GNOME 3.8), ultimate-edition-4.0-x64-lite.iso (2,085MB, desktop: MATE 1.6). Version 3.9 of Ultimate Edition, an Ubuntu-based distribution and live DVD featuring KDE 4.10.5 as the default desktop environment, is ready for download: "Ultimate Edition 3.9. Time has never been on my side, this is no exception. I am dumping Ultimate Edition 3.9 to the public. I am not going to make a big deal about it. I have had nothing, but pretty much good feedback on it. I am not even going to spend the time updating / upgrading it. I will be doing some catch up over the next few weeks when time is available. Let's get Ultimate Edition 3.9 behind us, so I can focus on the future." Here is the brief release announcement. Ultimate Edition 3.9 is based on Ubuntu 13.04 and besides KDE it also offers MATE 1.6 as an alternative desktop. The live DVD image is available for download from the many SourceForge mirrors: ultimate-edition-3.9-x64.iso (2,744MB, MD5).